The time has come! The week we have ALL been waiting for is right around the corner. Are you ready? College students have been waiting long enough to escape from classes while families are planning to spend as much quality time with them as possible. Sorry Mom, I’m on the road. See you when I get back! 🙂 What do you have planned for Spring Break 2014? Times are hard and the money is scarce, but you don’t have to struggle to have an amazing vacation. Whether you’re traveling to explore a new city or passing time laying on the beach, you can find locations that don’t break your bank and that satisfy your needs. 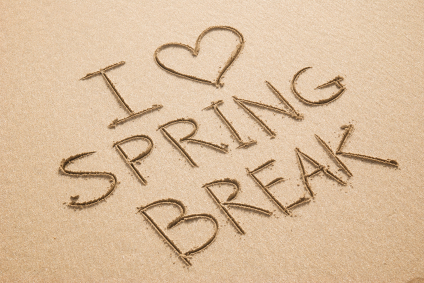 Here are five easy ways to budget your Spring Break. You have to start saving money NOW and trust me when I say that it’s extremely hard not being able to swipe that bank card whenever you please. We’ve hit the middle of February so that gives you a few weeks to build up your account. In reality, you should already be saving in order to make sure all traveling exspenses are covered. Nonetheless, when you save money, you give yourself time to organize. It’s easier on yourself when you know that you have enough money to do as you please and there’s an extra dollar or so for the hot bartender! Relax now and ball out later. It’s worth the wait! Choose a location to travel to that doesn’t go beyond your means. We dream of studying abroad or planning trips to luxurious destinations, but can you really afford that? Let’s keep it real. Staying in the United States is not as boring as it sounds. It’s been the annual hit for students and families to travel to Panama City Beach, Florida or to Washington, D.C. If you’re looking for something new, pick another state and do some research on whether or not its Spring Break worthy of booking. Remember: You don’t have to be on the beach because not everyone loves to tan. Why not bring your friends?! It’s time to get crazy and have some fun. #SB2014 The best thing you could do in order to have a great time is travel with a group of three or four. You could always invite more people, but keep in mind that everyone acts different under the influence. Some websites and companies actually offer group discounts and hotel packages when you’re booking your trip. You just might want to keep a few people on your list. Not to mention that with more people comes more planning, which can get a bit annoying. But…You can do it!!! Take this opportunity to spend time with your closest friends and make this a trip to remember. The best memories are made when you’re with your friends and having fun! You’ve been waiting for this cold weather to pass and honey, the wait is over. Depending on where you and your friends choose to travel, I’m sure you’ve planned your trip day-by-day. You have what you want written down, but what will you do when you’ve checked everything off your list? There are tons of restaurants, museums, art galleries, and attractions that you could experience. You guys could even look into what big events are happening in the city or resort you’re going to during the dates of travel. It’s better to get there and not have to pay for much, than to get there and spend your time traveling aimlessly looking for something to do. I guarantee you that being active with the locals and taking advantage of what they have to offer will increase your level of satisfaction. I hope this helps. Happy Travels! Let the countdown begin. ← Rise To The Occasion: God Will Restore and Increase!